Post Late Fees/Misc Fees allows you to post a fee to multiple families based on a selection of family criteria (location, status, current balance, etc.) and/or their students' current enrollment. The function was designed for late fees but can be used to post any type of fee using the Transaction Details to Post options. Point to Transactions and click Post Late Fees/Misc Fees. Tell Jackrabbit who you want to post fees to using the Search Criteria section. You can use one search field or use them in conjunction with one another. If you are posting a late fee, isolate which transactions you want to post late fees for using the With Unpaid Transactions section. Select a Transaction Date From / Through, a Transaction Type, and/or a Transaction Sub-Type. 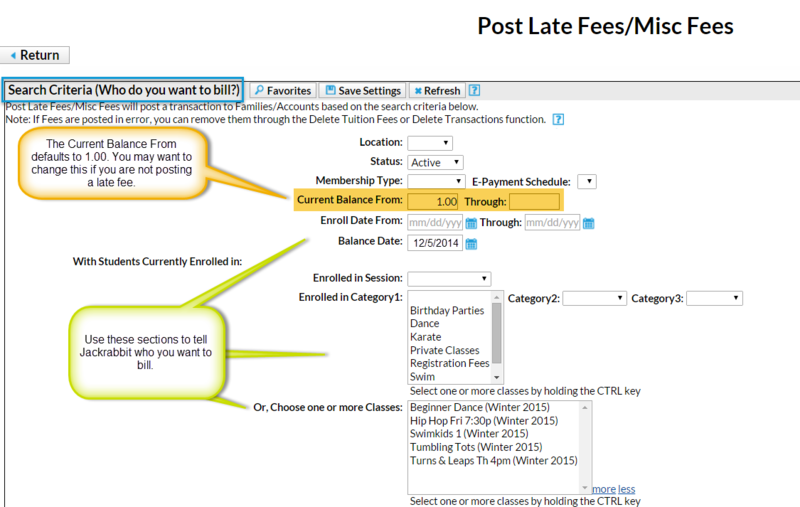 For example, if you only post late fees when tuition is late, you'd select, Transaction Type: Tuition Fee (Debit). Use Transaction Details to Post in the lower section to tell Jackrabbit how to post the fee transaction (date, type/sub-type, amount, note, category, and session) and whether you want the fee to post per Family/Account, per Active Student, or Per Student That Meets Criteria. If you change the Transaction Type to anything other than the default [which is Late Fee (Debit)], the Current Balance From in the Search Criteria section (at the top) will change to a blank field and an alert will display. Example: In the Search Criteria section, you leave the Current Balance From at it's default setting of 1.00; but in the Transaction Details to Post section you change the Transaction Type from the default of Late Fee (Debit) to another drop down choice. Because Jackrabbit understands that you are not posting a late fee, it blanks the Current Balance From field. If it did not, Jackrabbit would only post the fee to accounts that had a current balance of $1.00 or more. Note: If you have already changed the Current Balance From amount (it defaults to 1.00) in the Search Criteria section to another amount, it will not blank out the field because Jackrabbit assumes you intentionally changed the field. If Jackrabbit sees the same Transaction Date, Transaction Type, and Amount already posted for a family, it will assume this is a duplicate and skip it. Note: This only applies when posting the fee per family. There is no duplicate check when posting the fee per student. If you post the fee per Active Student and a family that meets the search criteria has 2 active students, Jackrabbit will post the fee twice (the fee multiplied by the 2 students). If you post the fee per Family/Account, Jackrabbit will post the fee once to each family that meets the criteria. When you opt to post only to Students That Meet Criteria Jackrabbit will only post a fee for those students who fit the criteria selected in the Who do you want to bill? section regardless of how many other active students are in the family. Click Preview Fees. This is a preview only. No fees will post until you click Post Fees. If you want to prevent a fee in the list from posting, uncheck the checkbox on the fee line. Uncheck the first checkbox, immediately under the All heading, to uncheck all fees. This is useful if you need to post fees to family accounts that don't exactly meet your search criteria. Once all are unchecked, you can check only the fees you'd like to post. When you are satisfied with the list, click Post Fees. In the pop-up box that says, This will create transactions for all selected families. Continue?, click OK.
Jackrabbit displays a list of the fees that posted. If late/misc fees are posted in error, use Transactions > Delete Transactions to delete them. See Delete Transactions for more information on deleting a fee.